20. 4. 18 - WRWS/NRHA - - Gennaro Lendi and Colonels Dancing Gun win the NRHA European Open Futurity. On Saturday night the curtain fell upon the National Reining Horse Association (NRHA) European Futurity, the largest reining show held outside of North America. Closing the prestigious event was the €143,750-added Open Futurity. Counting 53 finalists in the four divisions, it was truly showtime in Cremona! Owned, bred and nominated by Quarter Dream of Italy, Pietro Marseglia — owner of the Italian facility — was thrilled with the win. “We bred this horse and his dam, Dance Little Spook, won the Italian Open Futurity with [NRHA Million Dollar Rider] Rudi Kronsteiner in the saddle. Winning this event is twice as special for us!” he said. NRHA Professional of Germany Dominik Reminder had set the bar early in the second section by scoring a 223 aboard Call Me Mr Voodoo (Shiners Voodoo DR x Arc Sassy Snapper), a stallion owned, bred and nominated by Elisabetta Zoccarato. The duo settled for the L4 Reserve Championship. Tying for reserve honors in the L3 division was NRHA Professional Mirko Midili of Italy with Angelina Shining Gun (Colonels Shining Gun x Miss Alex Cody) for owner Asia Vimercati. The mare was bred by Tamara Pavlovic and nominated by Fabio Polesel. It was a special night for NRHA Professional Adriano Meacci who took both the Championship and Reserve Championship in the L2 Open division. The Italian professional claimed first place honors with a 214.5 aboard Topsail Chic Dunit (LMC Im Topsail Dunit x Topolena Pride) for owner Alessandro Tedone. The stallion was bred and nominated by Shenandoah Ranch. With a 214 score, Meacci rode Im A Bad Diamond (AB Captain Badger x Im A Queen Diamonds) for owners Amleto Angeletti and Romina Rossi to the Reserve Championship. The gelding was bred and nominated by Angelucci Quarter Horses. With a 213.5 score, NRHA Professional Petra Van Ede of Holland tied to win the L1 Open Championship —her first NRHA European Open Futurity title — with Cee U In Tinseltown between the reins. Owned and bred by Gisela Haas, the mare by NRHA Million Dollar Sire Hollywoodstinseltown out of Miss Wimpy was nominated by Haas’ husband, Paulus Beurskens. NRHA Professional Andrea Napolitano riding Calimero Whiz (Hesa Mega Whiz x Geny Olena), a stallion owned by Alessandra Sacchetti, bred by Sara Bevilacqua and nominated by Andrea Castrucci, tied for the L1 Championship. Once again the NRHA European Futurity, open to 4-year-old horses nominated in the NRHA Nomination Program, proved to be a success. 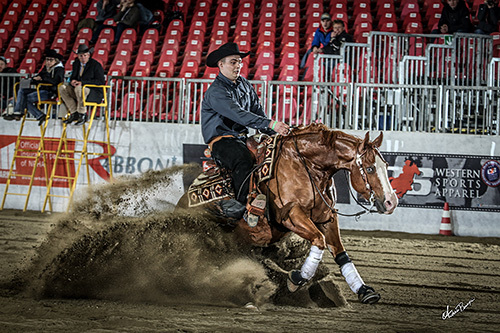 With over 15 nations represented, reining was showcased to its best. 20. 4. 18 - WRWS/NRHA - - Carlo Ambrosini and Saturdaynight Tag sweep the NRHA European Futurity Non Pro Level 4 and 3 Championships. 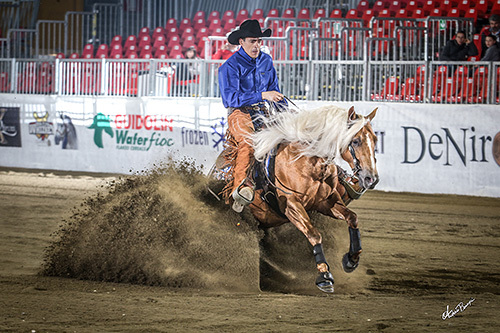 The National Reining Horse Association (NRHA) European Futurity, the largest reining show held outside of North America, this year celebrated its 10th anniversary; tonight, in Cremona, the €58,760-added European Non Pro Futurity closed the day and the first 2018 champions were celebrated. Ambrosini was quick to thank his parents for always being by his side and gave credit to his trainer, NRHA Million Dollar Rider Rudi Kronsteiner, for his work as well as NRHA Professional Marco Pettinari, who has been working for Ambrosini QH for the past five years. Saturdaynight Tag was bred and nominated by Ambrosini QH. Wictoria Stanco of Poland had already left her mark in the European Futurity Non Pro qualifier by posting the highest score. The 16-year-old rider from Poland did it again on finals night when she claimed the L1 Championship, with a 212.5, as well as the L2 Non Pro Reserve Championship. Stanco rode to top honors aboard her Remy Rooster SG, a stallion by Remin Whiz and out of Tea Rooster, a stallion bred and nominated by Italian Silvia Gandolfi. “I got this stallion last year two months before the Italian Futurity where I showed him and won the go round in the Level 1 non pro division,” said Stanco following her win. “I’ve always really liked him and I have to thank my trainer, Lukas Brucek, for doing a great job with him. The intention was that of showing him here this year but, before making the final decision, I showed him at the show held at Roleski Ranch in March where I won the NRHA Intermediate Non Pro class. At that point we decided we would come and he was great from day one. When you ride this horse, he makes everything seem so simple; all you need to do is trust him and he does the rest. The L1 Non Pro Futurity Reserve Championship went to Matteo Bonzano of Italy who rode Dyro Big Chex (Big Chex To Cash x Miss Pickie Cody), a mare owned and nominated by 23 Quarter Horses Az. Agricola SS, to a 210. On Saturday April 14, Europe’s best horses and riders will make their way in the CremonaFiere arena vying for the €143,744.61-added NRHA European Futurity Open titles. Purchase your tickets for the NRHA European Open Futurity finals: Buy your tickets online for the Open Futurity Finals! 20. 4. 18 - WRWS/NRHA - Der 2. 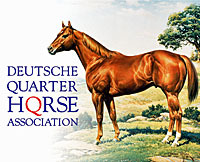 Tag der National Reining Horse Association (NRHA) European Futurity. The second day of competition at the National Reining Horse Association (NRHA) European Futurity provided excitement for the crowd in the stands as 58 of Europe’s best horses and riders rode into the CremonaFiere arena, vying for a spot in the finals of the €51,939.31 Non Pro Futurity. Setting the bar early in the draw was young Carlo Ambrosini, who posted a 214.5 to lead the Level (L)4 division riding his own Saturdaynight Tag. The young Italian’s score held until Suzanne Scharroo rode her own Topsail Wimp BB, a gelding by NRHA Nine Million Dollar Sire Wimpys Little Step out of Soft Whizpers to the L4 top score; a 216.5. “I really did not expect to do so well,” said the rider from the Netherlands about her mount bred and nominated by Eifel Gold Ranch Baeck. “[NRHA Professional] Cira Baeck showed him last year, and I purchased him after the Italian Futurity. It took a while to become a team, and now I can say that we really click, so I am thrilled and look forward to the finals,” said Scharroo, who is no stranger to European competition. Ambrosini and his gelding by Saturdaynight Custom out of Kachina Tag, bred and nominated by his family-owned facility Ambrosini Quarter Horses, settled for the second highest score in the L4 and the highest score in the L3 Non Pro qualifier. In the L2 division, Angelo Capitelli of Italy posted a 214 score to lead aboard his stallion, Peseta Whiz (Remin Whiz x The Hollywood Party), bred by Michele Chiapperino and nominated by Alessandro Farinelli. Wiktoria Stanco of Poland rode Remy Rooster SG (Remin Whiz x Tea Rooster) to a 213.5 score. The 16-year-old’s stallion was bred and nominated by Silvia Gandolfi of Italy. Following the NRHA Euorpean Non Pro Futurity qualifier, Open riders that did not make it to the finals in the €121,190-added European Open Futurity had a chance to ride for a spot through the Open Consolation. Those riders that did not make the Non Pro Futurity finals will have a chance to earn a ticket to the finals in the Consolation Non Pro, which will be held on Wednesday, April 11. The NRHA European Futurity also offers a full slate of NRHA approved classes. Ancillary competition will debut with the Intermediate and Limited Open, Intermediate and Limited Non Pro, and Rookie Level 1 and Level 2 classes following the Consolation. Closing the day was the FEI CRI3*. Riders representing nine National Federations rode for a chance to clinch a qualification score in view of the upcoming WEG. In a field of 19 riders, two Italian professionals tied to win with a score of 220: Mirko Midili riding his own ARC Sparkle Magnetic and Manuel Cortesi aboard PC Sliderina For Me owned by Francesco Mendolia. Italian riders also had a chance to ride for a spot on the Italian WEG Team as the CRI3* held on home turf is one of the qualifying competitions valid for team qualification. If you cannot make it to CremonaFiere, you can follow the action live on www.nrhaeuropeanfuturity.com where you will also find any information you may need. 20. 4. 18 - WRWS/NRHA - Giuseppe Prevosti führt in der „NRHA European Futurity Open Qualifier“. Giuseppe Prevosti leads the NRHA European Futurity Open Qualifier. Leading the L3 division with a 220 score were NRHA Professionals Stephan Rohde of Germany and Lukas Czechowicz of Poland. Rohde rode Michaela Maltz Szrama’s Glamshot, a stallion by I Am Shotgunner out of Boomernics Command, nominated by Sabrina Bojes. Czechowicz was seen riding CSG Piggiemove, a stallion owned, bred and nominated by Katarzyna Roleska. With a 216.5 score, two lady reiners tied to lead the L2 Open division: NRHA Professional Mona Dorr riding G Whiz Gus (Inwhizable x Peppiment Patti), a gelding owned by Martin Bachmann and nominated by Heike Melanie Ebler, and NRHA Professional Petra Van Ede riding Cee U In Tinseltown (Hollywoodtinseltown x Miss Wimpy Hollywood), a mare owned, bred and nominated by Gisela Haas. Van Ede and Cee U In Tinseltown also lead the L1 Open division. Open to 4-year-old horses nominated in the NRHA Nomination Program, the European Futurity is run in a qualifying go round and clean slate finals. The tenth edition of the NRHA European Futurity will continue with the Non Pro qualifier on Tuesday, April 10, and will be followed by the Open Consolation. 20. 4. 18 - WRWS/FN - Weltreiterspiele Tryon. WEG-Test Vielseitigkeit und Voltigieren. Fünf Monate vor den WEG ist die Situation trotz etlicher Baustellen vielversprechend. 19. 4. 18 - WRWS - Messe HansePferd Hamburg: wir sehen uns in wenigen Tagen auf der HansePferd 2018 – mit einem Angebot, das Sie begeistern wird! Bei über 470 Ausstellern finden Sie das Beste für Pferd und Reiter: von exklusiver Reitbekleidung, modernster Ausrüstung fürs Pferd bis hin zu neusten Trends im Stallbau und Pferdehaltung. Zudem können Sie bei mehr als täglich 100 Vorführungen über 300 Pferde und Ponys hautnah erleben! Hautnah: „Wilde Pferde als Vorbild“; HansePferd Hamburg präsentiert spektakuläre Filmaufnahmen. Das Beste für Pferd und Reiter: Rund 300 Pferde und Ponys aus 40 Rassen live erleben. Deutliches Ausstellerplus und noch größere Auswahl. Auf der HansePferd Hamburg schlagen die Herzen von Pferden und Reitern höher. Die beliebteste Pferdemesse im Norden präsentiert vom 20. bis 22. April Pferdefreunden, Pferdesportlern, Freizeitreitern und Einsteigern ebenso wie Haltern und Züchtern auf dem Hamburger Messegelände ein umfangreiches und vielfältiges Angebot. Freuen dürfen sich die Besucher auf rund 300 Pferde und Ponys aus 40 Rassen von niedlichen Shetlandponys über feurige Araber bis hin zu majestätischen Friesen. Eine GalaShow-Karte kostet für Erwachsene am Freitag, 42, am Samstag 45 und am Sonntag 39 Euro. Kinder zwischen sechs und 15 Jahren zahlen am Freitag 28, am Samstag, 29 und am Sonntag 25 Euro. Für Gruppen ab sechs Personen gibt es für Freitag Karten zum Preis von 34 Euro, für Sonntag zum Preis von 32 Euro. Die Karten für die große GalaShow „Herzklopfen“ gibt es unter www.hansepferd.de oder an bekannten Vorverkaufsstellen. Die Gruppenkarten können nur unter der Rufnummer 040-69650505 bestellt werden. 16. 4. 18 - WRWS/Tagesschau - Wenn die Reiterin selbst piaffiert. Piaffe und Galopp - vorgeführt von der Reiterin selbst, nicht vom Pferd. Dieses seltene Schauspiel bot Dressurreiterin Jessica von Bredow-Werndl beim Weltcup in Paris. Grund dafür: die Libido ihres Hengstes.